alaTest has collected and analyzed 75 reviews of Sony DCR-DVD 202. The average rating for this product is 4.3/5, compared to an average rating of 4.1/5 for other Camcorders for all reviews. Reviews about the image quality and durability are overall positive. The portability and size also get good feedback, but many are critical about the connectivity and zoom. We analyzed user and expert ratings, product age and more factors. 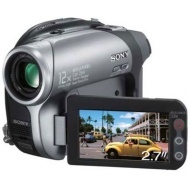 Compared to other Camcorders the Sony DCR-DVD 202 is awarded an overall alaScore™ of 78/100 = Good quality. This isn't really a camera for the absolute beginner, but it would be a perfect upgrade for a videographer who finds themselves with shelves full of tapes they struggle to find the time to edit. Size, weight, battery life, ability to record directly on DVD. The DVDs do not have the wide screen bit set and can not be properly imported to my editing software. The camera also has no digital output so, at the end of the day is useless. very easy to use, ideal camcorder for a beginner. it would have been nice to get a carry case with it. We havent found any yet! This is an easy to use camera, it even has an easy function...the fact that it records to disc is great as you can play these in an ordinary DVD Player, great for grandparents etc. You just need to be careful which type of disc you use as some can be overwritten and some can not. You can directly record on DVDs and no need of Firewire kit. However it seems that this technology is still at very early stage where you can only record 30 minutes of video on whopping 1.4 GB disk. You would need vedio editing software as well to combine multiple DVDs movies into one.